Apologies if you were looking for genuine advice on being fancy, as I'm not going to be serving any up. Instead, I'm going to be talking about this cute little Marks and Spencer's number. When challenged to pick a dress I'd wear to a formal event, I felt a bit lost. I'm not very good at feeling fancy, and suited for such events. I think it's rooted back to when I dyed my hair red and got all my piercings and felt like a sore thumb at any of James' families' do's, but I just don't think I do 'formal' very well. It's likely a confidence thing too, but I always feel like I look odd so I decided to play this out in the only way I know: add boots and a leather jacket. I'm a firm believer that your day usually vastly improves when you're feeling good about yourself, and confident in what you're wearing so the finishing touches are always important for me. You're probably wondering why I went for potentially the most prom-suited dress M&S had to offer, but I felt up for the challenge and I think I suitably bought it down to my level. What do you think? 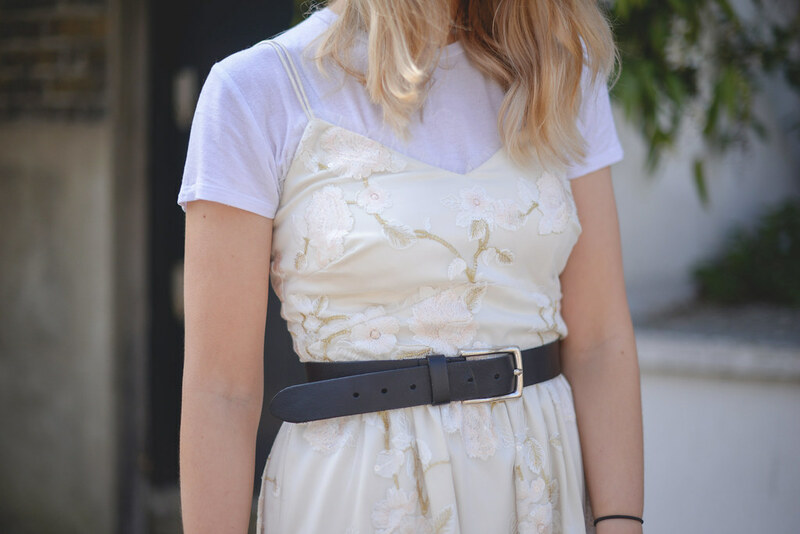 The addition of a leather jacket and some ankle boots always toughens a pretty dress up IMO, and the t-shirt underneath makes it all the more 'me', plus tea dresses are bang on trend at the moment and I think this is a great alternative. I think I managed to make it work, whilst still feeling 'fancy' enough for a wedding or such. You can see the full campaign and M&S' other dresses here. Post in collaboration with Marks and Spencer, all self confidence crisis and piercings my own. Love this outfit, a perfect way to show how to dress down a 'fancy' dress! Everything about these shots is giving me chills. The light, your hair, your expressions, your piercing and the way you've styled the dress.